My Birthday Teddy™ has super soft fur and is 50cm tall (32cm sitting). It is customised with the recipient’s name and birth-date or any special message embroidered onto the pad of the teddy’s foot. Your My Birthday Teddy™ will arrive with its own Birth Certificate and is beautifully wrapped in tissue paper and packaged in a special box. 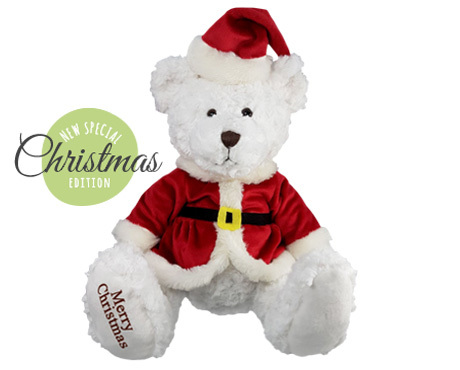 Your teddy will be delivered within approximately 28 days when you choose standard delivery within Australia. Platinum service is available for this teddy, delivery within 5 to 10 working days, simply select this shipping option when ordering (available in Australia ONLY). We can post this teddy anywhere in the world! Allow six weeks for International orders. Or you can enter your own special message. Important: Maximum 15 characters per line, including spaces. If you want your message to go on two lines, use Line1 and Line2. Enter the details that you would like embroidered on the paw of your teddy, using CAPITALS and lower case, if you wish. The bear will be embroidered EXACTLY this way. Please double check to confirm these details are correct!